JRPG Jungle: DLC Review: Persona 4 Arena Ultimax - Character DLC "Episode Adachi"
DLC Review: Persona 4 Arena Ultimax - Character DLC "Episode Adachi"
Warning: Spoilers for Persona 4/Persona 4 Golden are present in this review. Proceed at your own rist! Confession time: this DLC is half the reason I was so keen for Persona 4 Arena Ultimax in the first place. Have we all played Persona 4 to completion? I hope so. 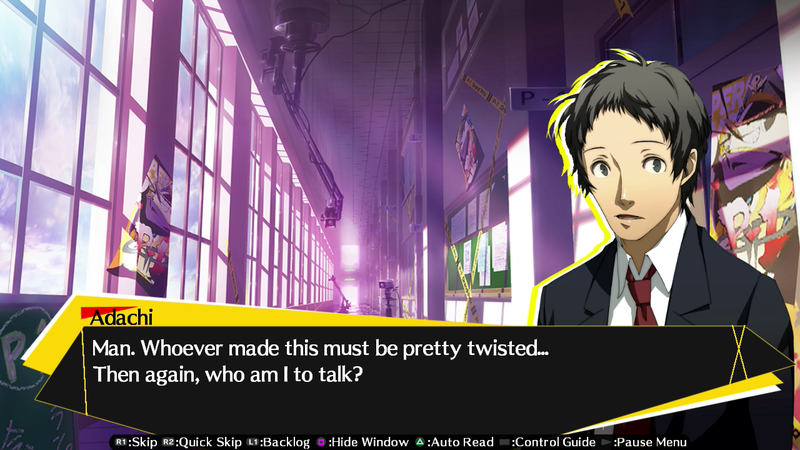 I'm sure I wasn't the only one wondering how Adachi would go in a prison (see, spoilers guys!). Episode Adachi has the answers in it's six chapter addition to Persona 4 Arena Ultimax's story mode. On top of that, it also gives you the cool, pistol whipping Adachi character to add to the already stellar cast of Persona 4 Arena Ultimax's roster of fighters. Episode Adachi begins while he's in custody, giving a humourous insight into Adachi throwing some shade at police officers. More importantly, it puts some much needed time into explaining why he's in this story and not as far away from any TVs as possible. If Episode Adachi's main role was to give explanation into just how his role in the story is done, it succeeds throughly, with the best parts of Episode Adachi based in the first few chapters that cover this. The bulk of Episode Adachi is hearing his perspective on Ultimax's events, giving a behind-the-scenes version of the story's events. Adachi's personality from Persona 4 is in fine form, with him throwing out a lot of 'What a pain' type phrases around and finding everything a big, annoying effort. If you're a fan of Adachi, you'll find enjoyment in spending more time with his humourous, but highly apathetic character. If you've been following the Persona 4 series and it's anime, this is story addition is the cherry on top of Adachi's character being explored more deeply in the anime, as the Persona 4 game only gave a small amount of development into his character, mostly at the end of the game. The only small criticism I can really give Episode Adachi is it's middle section feeling a little repetitive at points when you compare it to the Persona 4 story episode of Ultimax. However, this is to be expected as the middle section isn't giving much new content, just Adachi's perspective. The best part of Episode Adachi was it's epilogue, which left me feeling content with all loose ends of Adachi's story being fulfilled. The epilogue was a very fitting fate and probably the best possible outcome and development for Adachi. 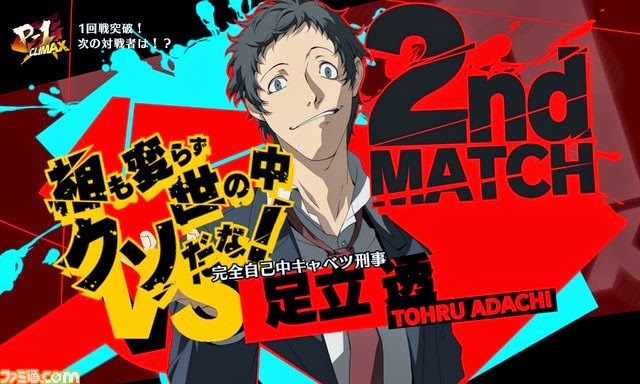 If you're not a big fan of Adachi as a character, but a fan of the Persona 4 or the Persona 4 Arena series, this DLC may be a bit hit or miss for some people. It's not an essential part of the Ultimax's story but it helped the story feel that little bit more complete. I think if you count the fact you get Adachi's character for fighting, style opinions and a story selection for about $7 (Australian price) is a good deal and is certainly the best value character to buy if you're looking to expand your roster of fighters in the game as Marie and Margaret's DLCs don't have an additional story mode (side note: they are still fun to play as though!). The story campaign lasted me maybe an hour or so, depending on how fast of a reader you are. Even though it's not a must have for all players of Persona 4 Arena Ultimax, Episode Adachi provides the final piece of the puzzle into his character development from Persona 4 and the anime and also an insight into some of the finer points of Persona 4 Arena Ultimax. If you're a fan of him, a diehard Persona fan or just want another character to play with, Episode Adachi is the best value DLC character you can get and while isn't a huge story mode, is worth tying up the loose ends left at Persona 4. Fun content and interesting story for those diehard fans of Persona and generally good value. The only DLC character with a story mode and goddammit, he comes with pistol whipping action. Not necessarily a must have for all players of the games though. The Adachi Character DLC is available from your country's PSN store. Prices will vary depending on your country! What were you thoughts on Episode Adachi? Comment below or send a tweet to @JRPGJungle and start a discussion. Thanks for reading!